Do you think there is a high chance that you are retiring with debt? If you are, then you need to do something about it. A secure retirement should not have any trace of debt in it. What makes a debt in retirement dangerous is the fact that it can compromise the little finances that you have. During this time, you are no longer working. You will just be relying on the retirement fund that you saved up over the years. Even with your Social Security benefits added to that, it will still not be enough. One emergency situation may compromise the funds that you are relying on throughout your retirement career. While retiring in debt is one of the biggest mistakes that you should avoid, it seems like a lot of people are failing at this. 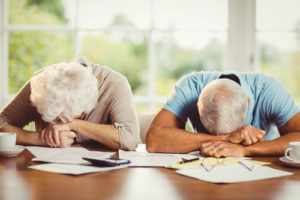 According to research, the number of debt in retirement is rising – specifically among retirees 75 years old and higher. What makes this dangerous is the effect that it has on the senior community. A lot of the elderly are choosing to forego required medical treatments because they cannot afford it. Even with government-sponsored medical aid, it is not enough to cover the high cost of medical care. Those who are brave enough to get treated end up getting into huge medical debts. Without a doubt, life in retirement is not as easy as it was in the past. What we thought was adequate is no longer enough. The usual target of a $1 million retirement fund is now deemed to be insufficient. If that is what you have and you still ended up retiring with debt, you know that you are in trouble. Your financial situation is not secure enough to give you the dream retirement life that you wanted. Admittedly, it will be very hard for those who are forced to retire with debt. However, your situation is not hopeless. With a solid plan, hard work, discipline, and determination, you can beat your debt situation and still enjoy the rest of your retirement. But before that, you need to identify the different debts that usually plague retirees. According to recent studies, the average debt of those between the ages of 65 to 74 is $66,000 while those who are 75 years old and above have an average debt of $34,500. Based on the same research, it has been identified that the top three debts are the following. It is not surprising that this type of debt is included here. After all, it is part of the American Dream. Owning your own house is one of the important investments that you can make in your life. However, it is also the highest debt that you will borrow. But since it is a debt that can help you increase your personal net worth, it justifies the mortgage that you have to loan. As you pay the monthly amortization, you get to increase the equity – which basically means you increase the value of what you own in the property. According to the report, this is usually the type of debt that is left even after all the others have been paid off. Even those who are 75 years old and above have this type of debt. Compared to home loans, the credit card debt of retirees is not as high in terms of balance. However, it is probably one that is most destructive. Reports reveal that a lot of senior citizens have accumulated 50% more credit card debts compared to the younger generations. What makes this type of debt dangerous is the fact that it has a high-interest rate. If not paid properly, this can quickly grow your balance and lead to overwhelming debt. If you have limited retirement fund, you do not want credit card debts to add to the list of things that you have to pay for each month. The third type of debt that retirees have to deal with is a car loan. The report revealed that this type of debt peaks when a person is between 35 to 44 years old. But the fact that even those who are 75 years old and above still have this debt should bother us. What makes this an unfavorable debt is the fact that it is for something that depreciates over time. That means the value of the vehicle goes down and you end up paying much more for it. When you are retired, you want your money being put into something that grows over time. A home loan is okay because the real estate property appreciates over time. A car does not have the same advantage. Now that we know the debts that are plaguing retirees, the question remains – what can they do to get rid of it? Retiring with debt is never a good thing because it compromises your limited funds. You want to make sure that your retirement money will outlive you – and not the other way around. Having debt will drain your finances and the interest rates will be a waste of money that would have been used to give you a good retirement life. While those who retired with debt are in a more dangerous financial position, that does not mean they cannot do something about it. There are ways to deal with debt even after retirement. Here are things that you can do. When you are retired, you do not really need a big home. You can choose to downsize your home so you can get rid of what remains of your mortgage. There are other financial benefits to enjoy when you downsize your house. But how do you do it? Well, you can choose to sell your house and buy a smaller one. You can use the equity that you have from your original house to pay for the smaller one. That way, you still own a house but without any debt attached to it. According to reports, a lot of retirees have a mortgage on their second or vacation home. You can simply choose to sell this – since it is not your primary residence anyway. You can use the equity from the house and add it to your retirement fund. Or you can use it to pay for any other debt that you owe. For the credit card debt that you owe, it will be more tricky to get rid of it. But it is not impossible. You just have to get in touch with the lender and negotiate your debts. You have your retirement fund with you. While it is not ideal that you get a lump sum from this fund to pay off your credit card debt, it is probably the best way for you to get a lot of savings from it. Call the creditor and negotiate to settle your debts. When you settle your debts, there is a higher chance that you will be allowed to pay less of your balance and have the rest forgiven. You can offer to use your retirement fund for this. When you have gotten rid of your credit card debts, the high-interest rate will no longer drain your retirement fund. You might have to think about getting a temporary job to replace what you lost – which will probably be easier since you no longer feel the stress of having a lot of credit card debts. Finally, your car loans will require you to make extra payments. Unless you want to get rid of your car, you have no choice but to pay this debt off. By making extra payments, there is a higher chance that you will pay off your debt earlier. You can increase your monthly payments or you can choose to make payments every two weeks. Doing so will help you pay an extra month every year. Of course, if you can sell your car and buy a cheaper one – as long as you are sure that it is still reliable and it will not cost you a lot when it comes to maintenance. This is one way for you to get rid of your balance. Retiring in debt is not an ideal situation but it is not an impossible position to get out of. You just have to know your options and make the sacrifices that will help you pay off your debts.